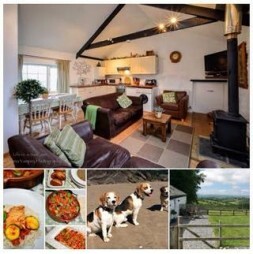 Based in stunning rural Carmarthenshire we offer:- breathtaking views - lovely accommodation (x 3) - enclosed gardens - no limit on the number of dogs - forest & mountain walks from the door - dog friendly beaches a short drive away - lots of dog friendly info - delicious home cooked meals- dog sitting service - free WiFi. We have 90 x 5 star TripAdvisor reviews and hold their Certificate of Excellence. My wife and I stayed here last August for our Anniversary wow what a place.The scenery is to die for,there are walks galore,beaches a drive away,which again are stunning.As for the place its self 5 stars,clean,beautifully presented,the food cooked by Nikki is a must.Nikki and her Husband can not do enough to make your stay perfect in every way,there advice and knowledge of the area is second to none.If you want a relaxing break away form it all then this is the place to go.